So I've got more time today than I have all week so I'll be writing some articles that I've had stuck in my head while I've been on the train to school back and forth. I've been alternating episodes of anime and Supernatural on my Vita while going to and from class so I thought that I'd give some impressions of what I've seen so far. A full review will go up once I've seen the whole first season. 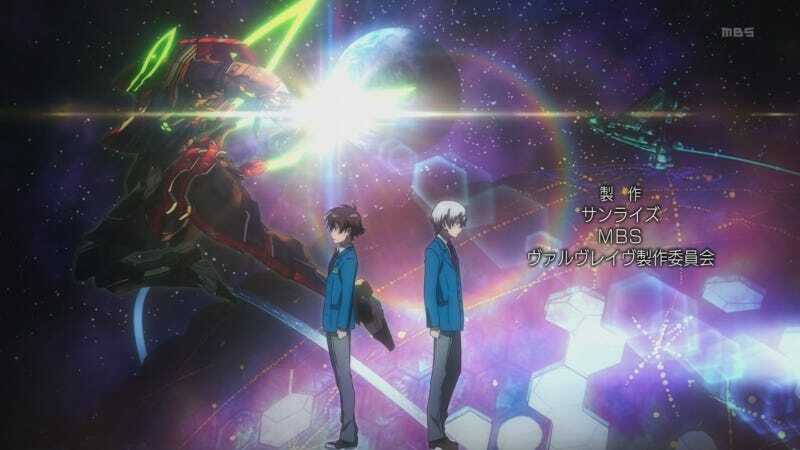 I've watched the first two episodes of Valvrave so far. I have to say I'm intrigued. It sets itself up with a pretty standard Gundam/mecha formula for the most part, but adds enough twists in that I don't wind up just wishing I was watching a Gundam series. The design of the mechs are pretty cool and it voices something that I've thought about before when watching these types of shows. Why are the robots always humanoid? Most of the designs of the mechs in the show are not in fact humanoid, with the exception so far being Valvrave itself. I'm guessing this will change going forward and we'll see more humanoid mechs show up as the enemies get stronger and stronger. The set up between the two main characters so far, Haruto and L-Elf is the fairly standard Gundam hero/rival set-up. The hero and the rival are both made out to be in a somewhat morally gray area which allows us to sympathize with both characters. It seems as if they could even come to respect each other, if they didn't come down on opposite sides of the conflict. We've seen countless different versions of this type of story, but because of some of the other aspects of the show I didn't mind too much, at least not yet. The differences from the norm I've spotted so far, have been interesting. The body switching ability that Haruto has, while it hasn't been fully explored yet has potential to be truly interesting if they actually do explore it fully. It even shows that while he's in the body of someone else, the muscle memory of the person he's inhabiting allows him to do things on reflex that he might not normally be able to do. He initiates the body transfer by biting someone, which is a little strange though. I don't know if it's actually switching or more of a possession type ability yet though. The romance subplot with Shoko was an interesting move, to see the romance be equally wanted by both sides right off the bat, but it was annoying for the cop-out in episode two, I hope they actually explore the romance past the initial confession/acceptance. Anyway, the first two episodes have been interesting enough to give me reason to continue watching the show past these two episodes. I'll update TAY with a full review when I've completed the season.